Whether you are a kid or a kid at heart, nothing beats an outdoor ranch horse birthday party complete with horseback riding! The perfect venue for large or small groups. Your guests will enjoy meeting each of the horses and our ranch mascot, Ranger, the adorable miniature donkey, as well as having the opportunity to do some horseback riding at the Surfin G Ranch. Horse themed parties are fun and creative with endless possibilities to make your special occasion a memorable birthday celebration. Book your horse birthday party with the Surfin G Ranch! At Surfin G Ranch, we offer fundamental horse training that will take a problem horse or horse with little or no training and turn him into a gentle, safe riding partner. We also like to teach basic horsemanship classes to horse owners that struggle with their horses or are looking for answers to make their horses more fun and safe to be around. If you are traveling to the Rio Grande Valley with your horse and you need a horse hotel for overnight boarding, we have a couple of options available for you at the Surfin G Ranch. There is a small paddock that includes a loafing shed and water tank that is perfect for one horse, or our back pasture can be utilized if you are bringing more than one horse. The back gate opens up to miles of great trail riding possibilities and is a short drive away from the beautiful beaches of South Padre Island. You also have use of the arena and round pen during your stay. Please call us for pricing and availability (956)408-0488. 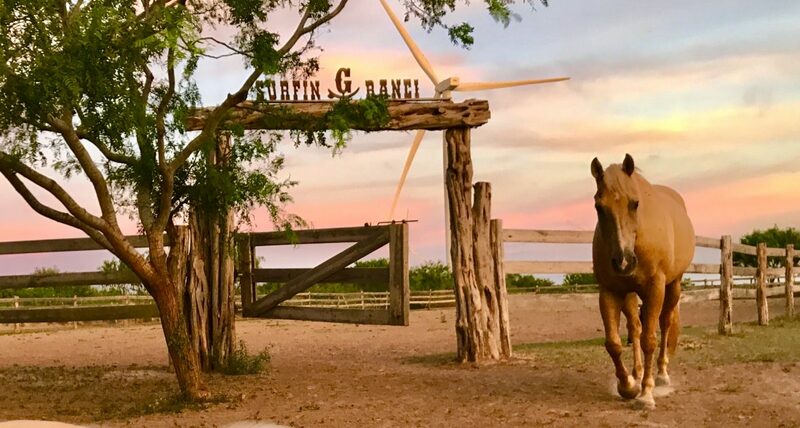 Situated between farm land that borders the Laguna Atascosa National Wildlife Refuge and located only miles from the beautiful beaches of South Padre Island, the Surfin G Ranch is the perfect horse hotel for the traveling equestrian that’s is need of an overnight horse boarding facility. With great trail riding right out the back gate and only a short drive to have access to miles of empty coastline perfect for horseback riding on the beach, Surfin G Ranch is the perfect location for keeping your horse.